r to carry the storied Documax badge. It features the latest technology in motors, drivers and electronics. The Documax 5380 sets a new standard for cost of ownership and reliability. torn off with no forms wasted. Standard interfaces are Ethernet, USB and RS-232 serial. The standard Documax 5380 is offered with popular Epson and Oki emulations. Bluetooth connectivity is offered on an optional model. AMT Datasouth also can provide OEM customers with custom emulations for their unique requirements. Internal fonts provide letter quality character and high-speed draft printing as well as popular bar code and OCR characters. Again, AMT Datasouth can provide OEM customers with custom fonts to meet any special requirement. SDM printing is favored for low-cost printing and product reliability and is especially favored for back office and inhospitable environments. The Documax 5380 brings a modern implementation to this trusted technology. The Documax 5380 is priced below all comparable printers in its class and, with its four million-character ribbon, provides a low cost printing solution. Its rugged design assures reliability and long life even in the most demanding applications. The AMT Documax 5380 will deliver trouble free, cost effective forms printing in the warehouse, inventory stores, front and back-office, shipping and wherever trouble-free forms printing are required. AMT Datasouth SDM printers are available to end users through authorized resellers. For complete Documax 5380 details see the product brochure and specification at http://www.amtdatasouth.com/gallery/documax-5380-p… . The Documax 5380 is now being shipped. AMT Datasouth has been delivering SDM printers since the early 1980s. More than a half-million of its Accel and Documax brand printers have been sold into thousands of locations. 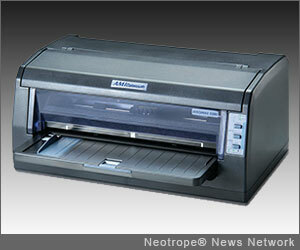 The Company also offers a complete line of thermal bar code and label printers under its Fastmark brand. The Fastmark printers feature the renowned PAL(TM) application programming language to seamlessly integrate them into existing IT systems and can replace embossers, impact or other legacy printers without host reprogramming. AMT Datasouth has built its reputation on providing its customers with what they want. For additional information, visit: www.AMTdatasouth.com . Copyright © 2013 Neotrope® News Network – all rights reserved.